May you never feel lost and confused in the dairy aisle again. While alternative dairy options have become increasingly popular in recent years, cow’s milk is still a staple of the American household. The average American drinks approximately 23 gallons of milk per year, not including all of the other dairy products made with milk. Dairy cows are being pushed to keep up with the demand, producing 10 times more milk than they were only a few decades ago, with the help of bovine growth hormones, unnatural diets, and selective breeding. The labels on a milk carton hide a lot of these dirty details, and with so many options, it can be difficult to know which one to pick. To help you make sure that the milk you’re buying lives up to your standards, we’ve broken down all the labels you might come across. The next time you’re surveying the dozens of cartons in the grocery store aisle, you'll be able to see right through any dairy deception. What it means: Has not had any of the fat removed. Whole milk is typically 3.5% fat. What it means: Has had enough fat removed to reduce the fat content to 2%. What it means: Has had enough fat removed to reduce the fat content to 1%. What it means: Has had all of the fat removed from the milk. Sometimes referred to as “fat free” or “non-fat”. The most common method for removing fat from milk is through a centrifugal separation process (think of a ‘Gravitron” carnival ride separating the milk and fat through high-speed spinning) . A less common method is by using gravity and time to allow the cream to rise to the top of the milk, which is then skimmed off manually. What it means: Lactose free milk is made for consumers who have trouble digesting lactose. The lactose is not removed from the milk, but rather converted into glucose and galactose through the process of adding lactase to the milk. Our take: Although lactose free milk is slightly denatured, there is nothing inherently unhealthy or unethical about the processing or final product. So if you have a lactose sensitivity or intolerance but still crave milk, then lactose free milk is probably a good option for you! What it means: A process that utilizes high pressure to break down the fat molecules in milk so that they do not separate and create a layer of cream on top. Homogenization also allows for the monitoring and managing of product consistency over time, as it enables previously-separated milk solids and fat to be incorporated. Our take: Homogenization does alter the properties of a product. Homogenized milk is nearly ubiquitous in the U.S, so it can be difficult to find it non-homogenized. However, there is nothing inherently unhealthy or unethical about the process or the final product. What it means: A process that utilizes a higher pressure than normal homogenization, achieving the same effects while also extending the shelf life of the product. Our take: Since this process helps to increase shelf life, if you’re someone who enjoys milk in coffee, tea, or cereal and doesn’t want milk to go bad in the refrigerator, then ultra-homogenized milk might be just fine you. What it means: The process of heating milk to 161 degrees F for 15-30 seconds in order to kill any germs and bacteria. Nearly all milk sold in the U.S. is pasteurized. Our take: The potential problem with pasteurization is that the process kills both the beneficial bacteria that help build healthy gut flora, and the potentially harmful bacteria. Sadly, due to the massive scale of milking operations, pasteurization has become largely necessary for consumer safety. Most dairy farms are producing at such an incredible rate that it’s impossible for the herd to subsist on a natural diet of grazing and dried forages. This means that the diet of the cow consists mainly of grain, corn, and soy. Consequently, the cow does not develop a healthy immune system and is constantly in danger of becoming sick. Dairy cows are therefore constantly given doses of antibiotics. As a result of this compromised immune system and dependence on antibiotics, the risk of potentially harmful bacteria being present in conventionally farmed milk before pasteurization is very high. If you are purchasing conventional, non-organic milk, pasteurized milk is highly recommended. What it means: The process of heating milk to 300 degrees F for 2 seconds and then quickly cooling it. 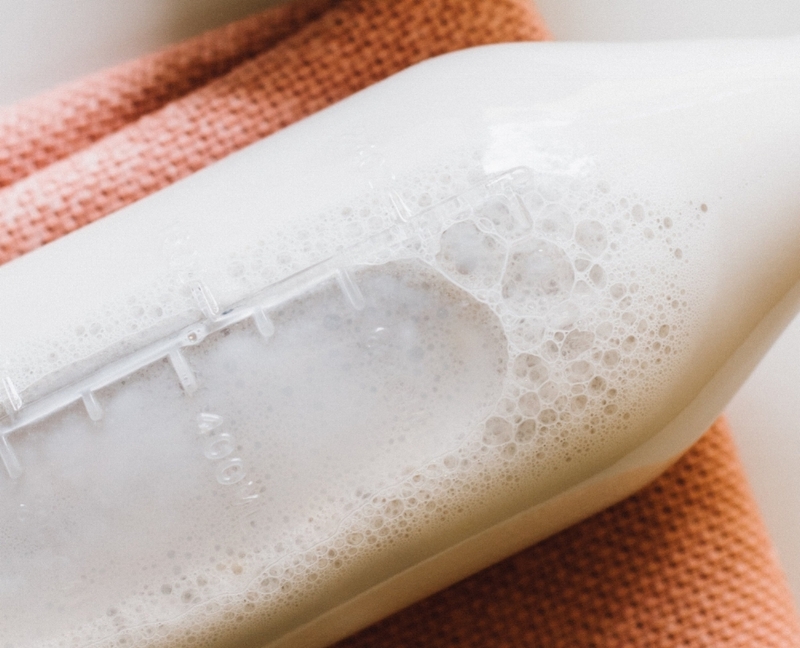 The main advantage of UHT is that it gives the milk a much longer shelf life, making it an appealing option for supermarkets that are concerned about selling milk before it goes bad. However, UHT doesn’t increase product viability after opening to a great extent. Our take: The same drawbacks and benefits associated with pasteurized milk are present with UHT milk. UHT does, however, combine the benefits of pasteurization with the benefits of ultra-homogenization by extending the shelf life of the product. So if you drink milk sparingly and don’t like waste, UHT is a good option. What it means: Raw milk has not been pasteurized or homogenized. The laws regarding selling raw milk in the U.S. vary state by state, however there is a federal law that bans the interstate selling and distribution of raw milk, meaning that any milk crossing state lines must be pasteurized. As of 2016, 13 states allowed the sale of raw milk in retail stores, 17 states allowed the sale of raw milk strictly on the farm where it is being produced, and 20 states prohibited the sale of raw milk entirely. Our take: The potential benefits of purchasing and consuming raw milk are many! Raw milk is not homogenized, leaving the fat that forms the cream, which not only makes the milk much more delicious, but also gives the consumer the option of using the cream for homemade butters and whipped cream. Buying raw milk helps to support local farmers near your home, and often puts the money directly into their pockets by cutting out the retailer. Raw milk also leaves the beneficial bacteria intact that occurs naturally in dairy, which helps to create and maintain healthy gut flora. Conversely, due to the fact that it is not pasteurized, there is the possibility of potentially harmful bacteria, which could adversely affect someone with a compromised immune system. However, this is less likely if the farm producing the raw milk is engaged in proper grazing practices and animal care. If you do want to purchase raw milk, do research and get to know your local farmer before committing to the purchase. General rule of thumb: when in doubt, go with certified organic or 100% grass-fed. What it means: rBST, or bovine growth hormone, is a synthetically-created hormone that is injected into dairy cows in order to increase milk production. The rBST Free label indicates that the dairy cows used to produce this milk have not been given any synthetic growth hormones. Our take: rBST causes major health concerns for the cow, including reproductive issues, lameness, and mastitis (an inflammation that causes pain in the breast or udder tissue). It has also been found that rBST cows are culled (killed or removed from the herd) at a higher rate. To be certain of positive animal welfare, buy milk that is USDA Certified Organic or has the rBST Free label. What it means: Organic milk comes from cows that have not been given any antibiotics. If an organic dairy cow has been given any amount of antibiotics, it is separated from the rest of the cows, and the milk is sold as conventional milk. Dairy cows producing organic milk must be allowed to graze for the grazing season of their specific geographical region, which is no fewer than 120 days per year. 30% of the dairy cow’s diet must consist of grazing, and the remaining 70% can consist of manufactured feed, including grain. Our take: Purchasing certified organic milk is the easiest option for conscientious consumers who want to support better farming practices while drinking a tasty and nutritious product. Perhaps the greatest benefit of purchasing organic milk is the guarantee of no growth hormones and no antibiotics. Buy organic whenever possible! What it means: This refers to dairy cows that live on, or have access to, pasture for a portion of their lives. They are allowed to graze, but also receive grain feed in their diet. The use of antibiotics is permitted. Governing agencies have not been able to agree upon a uniformly-accepted standard for producers to meet in order to be allowed to label the finished product as “pasture raised,” nor have they been able to agree upon a standard definition for “pasture,” or a requirement for verification of such claims through on-site inspection. Our take: This is a better option than purchasing milk from cows that are raised using conventional methods, however, there is ambiguity in the label. “Pasture raised” is the livestock practice equivalent to “natural,” which is to say that it doesn’t tell you much at all. Organic is a better option. What it means: This refers to dairy cows that have been raised on pasture, with their diet coming from grazing and/or dried forages, such as hay. Dietary supplements and antibiotics are permitted. Governing agencies have not been able to agree upon a uniformly accepted standard for producers to meet in order to be allowed to label the finished product as “grass-fed.” This means that it’s possible some brands labeling milk as “grass-fed” are also feeding the cows grain in addition to grass. Our take: Like pasture raised, a grass-fed claim can be ambiguous. That said, it’s still a much better option than conventional. What it means: This refers to dairy cows that have been raised on pasture, with the entirety of their diet coming from grazing and dried forage, such as hay. Dietary supplements are allowed, as long as no grain rations are used. Use of antibiotics is permitted. Our take: This indicates a natural diet and a healthy immune system, and is a highly recommended option when available—especially when the product is also certified organic. Paige is a junior at the University of Chicago studying Linguistics and Creative Writing. She loves pickling and fermenting to naturally preserve her leftover fruits and vegetables. Right now she’s obsessing over Trickling Springs Creamery Vanilla Ice Cream— rated GREAT!